A few weeks ago was Momocon; the ultimate 4-day event for fans of anime, comics or games. Speelbaars traveled to Atlanta to showcase Lumini to over 18,000 visitors! Having recovered from my jetlag, I’d like to share our experiences with you, whether you’re a fellow game developer looking to attend events yourself, or if you’re just interested in our adventures in the U.S. So, now we needed to get ready for Atlanta. Preparing for an event can be a lot of work, usually even more than attending the event itself, especially when you have to travel half-way around the world. As a foreigner entering the United States, you need to be authorized to cross the border, either through the ESTA ( https://esta.cbp.dhs.gov/esta/ ), if you’re staying less than 90 days, or by applying for a visa. Owning a passport is also a must, of course, and then there’s the booking of hotels and flights. This, however, is the easy part. Money can also be an issue. Luckily, we were able to apply for government funding, thanks to the Dutch Stimuleringsfonds. (http://stimuleringsfonds.nl/ ) This helped us a lot and in return, we help promote the Dutch creative industry. The most time consuming task however, is creating a stable, quality build of your game. You need to determine which parts of the game you want to show; you might want to leave out certain parts, because they’re not polished enough or because you don’t want to reveal too much just yet. Don’t underestimate how much work can go into creating a presentable build; you never know what kind of hurdles might show up. For instance, just when we were ready to create a new build (thinking we were ahead of schedule), we encountered a bug that prevented us from making ANY builds at all, with no easy fix. In the end, our final Momocon build was done just a day before we left! But, we made it in time and we were on our way to the USA. 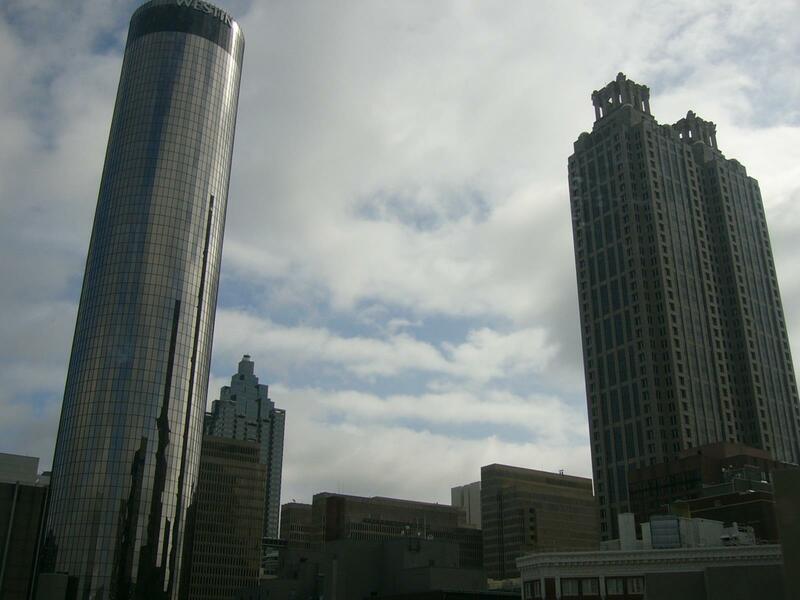 We got to Atlanta about a day and a half before Momocon started, giving us plenty of time to check-in to our hotel, do some sight-seeing and get settled in. We brought two laptops and a power strip (plus a universal converter! ), but wanted to see if we could rent a TV screen on which to show Lumini. When we found out that renting a TV would cost hundreds of dollars, we decided to just ask the Momocon staff if they had a spare TV. Turns out they did! Our booth was fully prepared for 4 days of Momocon. Banner, flyers, businesscards, we had it all. Showcasing your game is exhausting, so it’s good to have teammates with you and take turns manning the booth. Make sure you’ve stacked up on food and drinks beforehand (everything you buy at the event will be three times as expensive), and that you’ve got enough sleep. You’re going to need it! 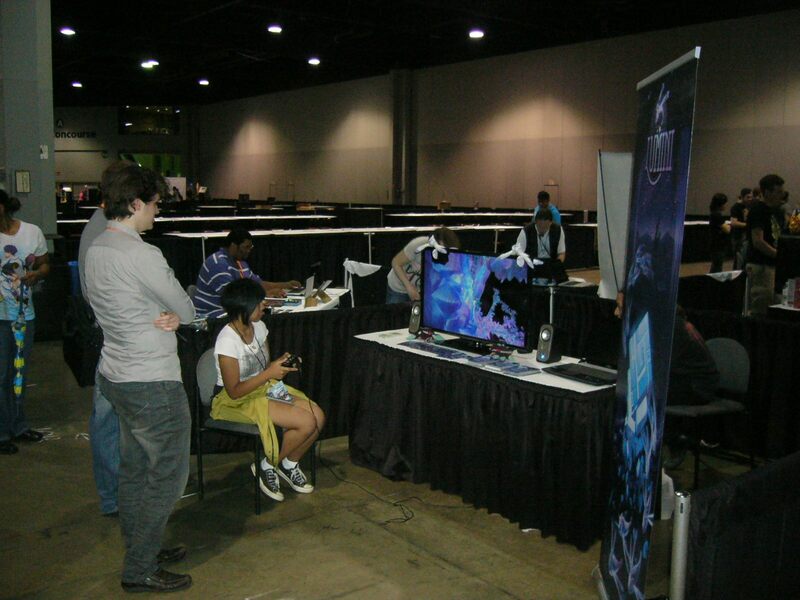 Momocon was our biggest event to date and it was noticeable; Lumini was being played non-stop. We had one laptop hooked up to the TV and used the second laptop to loop the Lumini trailer. We considered running the game on the second laptop as well, but decided we didn’t want to draw attention away from the TV screen. A lot of people who weren’t playing the game would hang around the booth to watch, so we made sure to leave enough space in front of the booth for people to stand and look. Whenever we took a break, we’d look around and visit the other developers. Not only are they useful contacts to have, but it’s also good (and fun) to keep track of what the rest of the industry is up to. Attending an event is a lot more enjoyable when you meet other developers and share your experiences. It’s important to keep your morale up, because you never know when the next visitor or interviewer might walk up to you. Be prepared to give your best smile at any time (and if English isn’t your native language, you might want to practice it a bit first.)! In the end, we didn’t win any awards, but we still got a lot of exposure. We had several interviews, made contact with some ‘Let’s Players’ and of course, introduced our game to a lot of people! We got some great feedback and we can’t wait to release the game in just a few months. 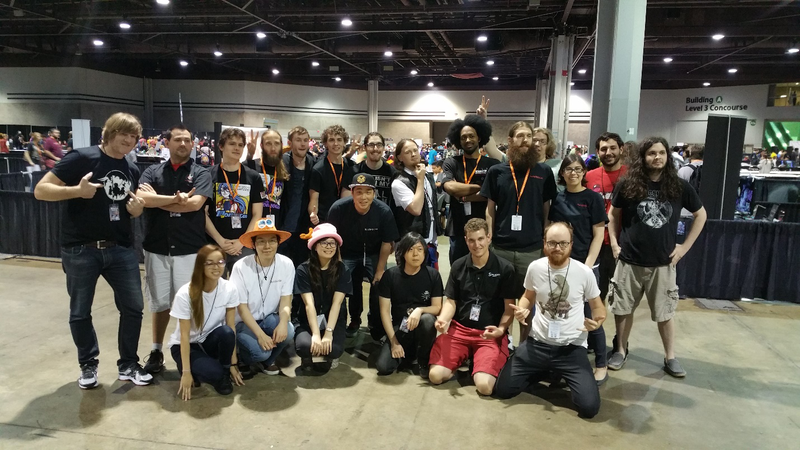 We also wish the best of luck to the other devs we met at Momocon; we saw some amazing games and we’re looking forward to the final results!